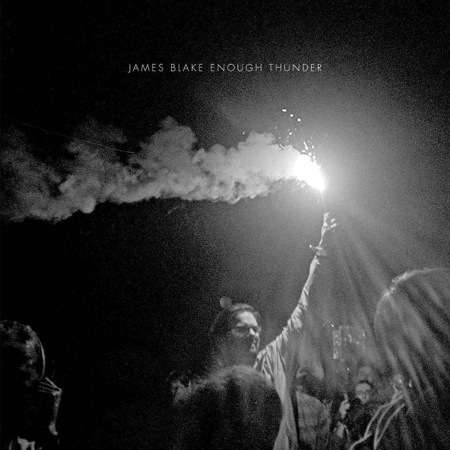 UK indie influential James Blake has revealed artwork and an October 10 release date for his new 6-track EP, Enough Thunder. The EP will include the title track, Blake’s much-discussed Bon Iver collaboration, “Fall Creek Boys Choir,” and four originals. Blake made quite a splash on Twitter after an August 17 tweet cryptically suggested some form of collaboration with fellow indie-star Bon Iver. On August 24, their song “Fall Creek Boys Choir” debuted on BBC Radio One. Blake made his announcement via Facebook, and, like his Twitter reveal of the Bon Iver collaboration, his posts left fans and media guessing. The announcement rode the gossip train before Pitchfork confirmed that the mysterious Enough Thunder was, in fact, an EP. “Enough Thunder” was the title of a song that Blake debuted in concert earlier this year, and the two words were also included in Blake’s cryptic Bon Iver collaboration tweet. If nothing else, the EP may serve as an endpoint for this constantly thickening plot. Enough Thunder follows the UK wunderkind’s three 2010-release EPs, The Bells Sketch, CMYK, Klavierwerk. It also joins his debut studio album, James Blake, released on the ATLAS label in February 2011.